In Aukland, New Zealand, in the Develport Naval Museum there is a strangely shaped large chunk of grey steel. It was a part of HMNZS New Zealand’s X turret after she’d been hit by a German shell at Jutland. “…there was a terrific explosion alongside us and the whole place became filled with dense yellow smoke. I shipped smoke pads, goggles and everything we are supplied with and slipped down into the turret expecting every moment the magazine would go up. Nothing happened… There was absolutely no panic and as soon as the smoke cleared, we found everything worked properly and went on firing” (Lieutenant Boyle). Moments later, three men lifted and moved the 1,064 lbs (483kg) slab of armour to free the rollers on which the turret turned. 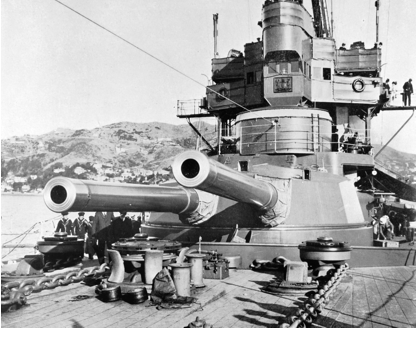 New Zealand’s gunnery record at Jutland, however, was not that impressive. She’d expended a total of 420 heavy caliber rounds with one, possibly four hits: three on Seydlitz and one on the pre-dreadnought SMS Schleswig-Holstein. HMNZS New Zealand’s powerful BL 12 Mk X guns.